This is our brand new mini fridge which can keeps your food and drinks the perfect temperature while at home and on the go. Equipped with a thermostat and cooling compressor, you can enjoy the cool beverages or hot food at any time .The ultimate versatile cooler, this mini fridge goes from cooling to heating with just the flip of a switch. The cooling capacity ranges from 59ºF-68ºF and its warming capacity is 122ºF-140ºF. Compact space saving design and lightweight features make it easy to take with you anywhere, yet can still fit your needs. Don't hesitate to buy one ! AC plug & DC adapter included. 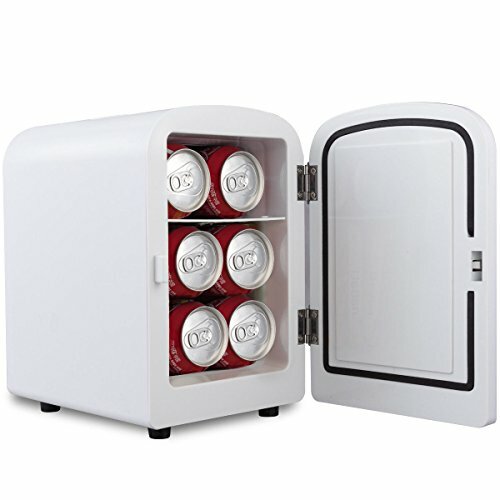 【2 in 1 Hot and Cold Function】- This mini fridge converts from cooling to heating with one switch. The cooling capacity ranges from 59ºF-68ºF and its warming capacity is 122ºF-140ºF. Red and Green light indicate warming or cooling status. A thermostat and cooling compressor enables you can enjoy both the cool beverages and hot food at any time. 【Compact and Space-Saving Design】- The compact size make it portable and convenient to be stored. You can put it in your home, office, car, caravan or boat for your outdoor living or activities. 【Removable Shelf & Self-Locking Recessed Door Handle】- Removed shelf can provide you more choice for arrange food inside this mini fridge according to different features. The handle brings much convenience for you to carry or take the fridge. 【Two Modes AC& DC Supply】- Our product can work normally with both ac and dc voltage power supply, so you can use it whatever you are in home or company. Besides, both cords of plugs into your cigarette lighter or home outlet are included. 【Eco-Friendly Consumption and Use】- This product requires low power consumption and it's free from pollution. This cooler and warmer is environmental-friendly and for cost-effective.